Leftover grilled chicken is an easy and quick way to create a meal the next day. When you are cooking or grilling chicken make extra for another meal and it will eliminate a step. Add your favorite ingredients and a meal is on the table fast. If you don’t have all the ingredients being used, add what you have on hand or what you would prefer. Also orzo pasta would be a great substitute for the Israeli style couscous. Lemon Infused Olive Oil can be purchased on-line at Spicewood Food Company. Heat olive oil over medium high heat in a large deep skillet. Add onions and sauté until translucent. 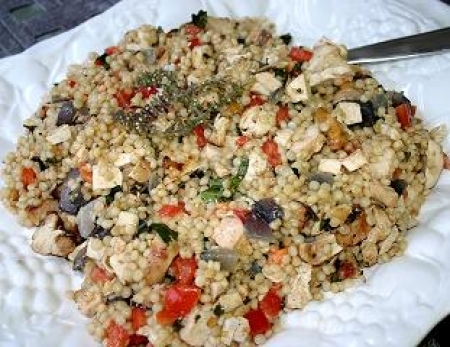 Add couscous and sauté until lightly browned, about 2 to 3 minutes. Add garlic, broth, salt and the basil. Stir and cover. Lower heat and simmer until all liquid is absorbed, about 20 minutes. Once all liquid is absorbed add the chicken, tomatoes, remaining fresh basil and lemon infused olive oil. Stir until well combined. Serve family style. Try Gabbiano Pinot Grigio (Italy), Pomelo Sauvignon Blanc (California), Villa Maria Chardonnay Private Bin (Marlborough, New Zealand), Samuel Adams® Hefeweizen (Boston, MA) with lemon wedges, Paulaner Hefe-Weizen (Germany) with lemon wedges or Flensburger Brauerei Gold Premium Lager (Germany) with lemon wedges.